The Huskies set records for points in a game (140), a half (94) and a quarter (55) in a rout of St. Francis in the first round of the NCAA tournament. 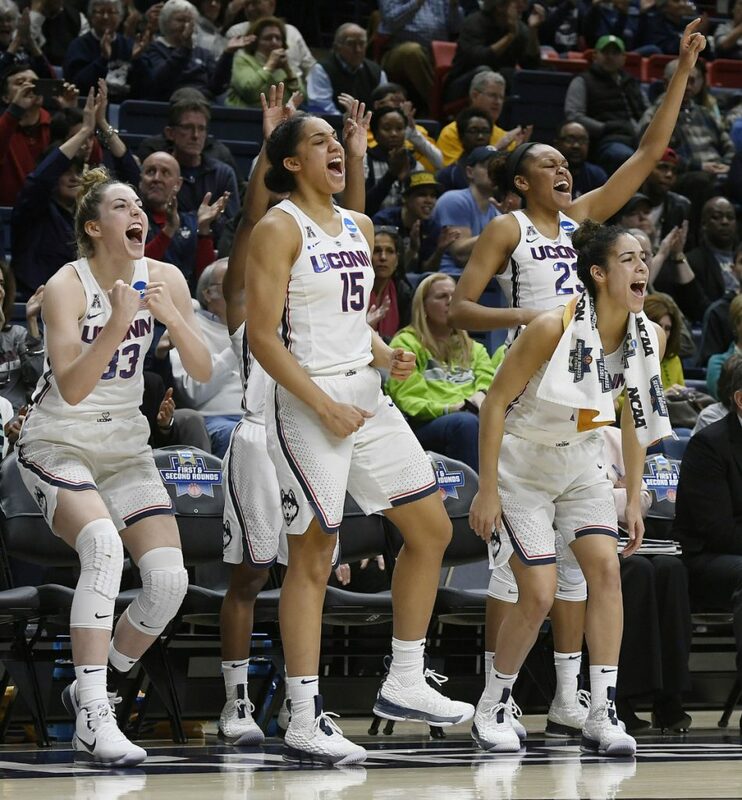 STORRS, Conn. — The UConn women’s team was in an online group chat watching the UMBC men upset top-seeded Virginia in the first round of the NCAA Tournament. The players assured each other that they weren’t going to let anything similar happened to them. All upset hopes ended in the first few minutes of this game. Azura Stevens scored 26 points and 10 rebounds to lead six UConn players in double figures and the Huskies opened their NCAA Tournament with a record-setting 140-52 rout of Saint Francis (Pa.) on Saturday. “I don’t think (the UMBC) game put extra pressure on us, but watching a No. 1 go down kind of motivated us to kind of come out from the start to be ready to go,” Stevens said. The women’s top seed set a record for points in a tournament game and all-time NCAA records for points in a period (55 in the first) and a half (94 in the first). And UConn’s 88-point margin of victory was the second-biggest in tournament history. Baylor beat Texas Southern by 89 in the 2017 tournament. The previous record for points in a tournament game was 121. The previous mark for points in a half was 80 and for a quarter was 45. Kia Nurse finished with 15 points and 10 rebounds. Napheesa Collier had 25 points and nine assists. UConn (33-0) shot 65 percent from the floor, 73.6 percent in the first half, and outscored the No. 16 seed 96-10 in the paint. Haley Thomas had 12 points and Caitlyn Kroll 11 for Saint Francis, which finishes the season 24-10. Jessica Kovatch, who came in as the nation’s second leading scorer at just under 25 points per game, finished with nine, all in the second half. Saint Francis Coach Joe Haigh said his game plan was to outscore the Huskies, to run and gun, while leaving UConn’s post players open for mid-range jump shots. His team averaged nearly 81 points a game coming into Saturday. The strategy didn’t work. The Red Flash attempted 57 shots from behind the arc, making just 10 of them. Samuelson opened the scoring with a 3-pointer, the Huskies made their first nine shots. They took their first 30-point lead in the first quarter on Samuelson’s reverse layup that made it 41-10 and ended the quarter with a 55-19 lead. Collier’s basket with more than six minutes left in the second quarter gave UConn a 68-26 lead, giving the Huskies the tournament record for points in a half. Nurse’s layup with more than three minutes remaining made it 82-28, giving them the NCAA record. UConn led 94-31 at the break. UConn is looking for its 12th national title and fifth in six years. The Huskies haven’t lost in the opening round since 1993. FLORIDA STATE 91, LITTLE ROCK 49: Shakayla Thomas scored 26 points and third-seeded Florida State (26-6) defeated No. 14 seed Little Rock (23-10) at Tallahassee, Florida. DUKE 72, BELMONT 58: Leaonna Odom scored a career-high 25 points, including nine in a dominant third period, and fifth-seeded Duke (23-8) beat No. 12 seed Belmont (31-4) at Athens, Georgia. QUINNIPIAC 86, MIAMI 72: Jen Fay led a balanced offense with 19 points and ninth-seeded Quinnipiac (28-5) beat eighth-seeded Miami (22-11) at Storrs, Connecticut, eliminating the Hurricanes for a second consecutive season. BUFFALO 102, SOUTH FLORIDA 79: Cierra Dillard scored a career-high 36 points and No. 11 seed Buffalo (28-5) got its first NCAA tournament victory, defeating sixth-seeded South Florida (26-8) at Tallahassee, Florida. GEORGIA 68, MERCER 63: Caliya Robinson had 23 points and 16 rebounds, Mackenzie Engram added 21 points, and fourth-seeded Georgia (26-6) held off 13th-seeded Mercer (30-3) at Athens, Georgia. CREIGHTON 76, IOWA 70: Jaylyn Agnew scored 24 points and Sydney Lamberty added 20 to lead No. 11 Creighton (19-12) over No. 6 seeded Iowa (24-8) at Los Angeles. ARIZONA STATE 73, NEBRASKA 62: Robbi Ryan scored 16 points and Kianna Ibis added 14 to lead No. 7 seed Arizona State (22-10) over No. 10 Nebraska (21-11) at Austin, Texas. OKLAHOMA STATE 84, SYRACUSE 57: Freshman Jaden Hobbs scored a career-high 27 points, and Loryn Goodwin and Kaylee Jensen added 19 as No. 9 seed Oklahoma State (21-10)beat No. 8 Syracuse (22-9) at Starkville, Mississippi. FLORIDA GULF COAST 80, MISSOURI 70: China Dow scored 21 points and played stingy defense in the paint against Sophie Cunningham, and No. 12 seed Florida Gulf Coast (31-4) pulled off an upset with a win against fifth-seeded Missouri (24-8) at Stanford, California. CENTRAL MICHIGAN 78, LOUISIANA STATE 69: Tinara Moore scored 25 points to help 11th-seed Central Michigan (29-4) get its first NCAA tournament win with a victory over No. 6 LSU (19-10) at Columbus, Ohio. OHIO STATE 87, GEORGE WASHINGTON 45: Stephanie Mavunga scored 22 points and grabbed 13 rebounds as third-seeded Ohio State (28-6) routed No. 14 George Washington (19-10) at Columbus, Ohio. STANFORD 82, GONZAGA 68: Alanna Smith scored 20 points and No. 4 seed Stanford (23-10) beat visiting Gonzaga (27-6).